WITH LOVE: Roses have always been a symbol of love. ROSES are undoubtedly the most popular flower when it comes to Valentine’s Day. Roses have always been a symbol of romance, beauty, passion and love. There are several legends about this well-loved flower. One is that of a beautiful woman called Rodanthe, who was pursued by many impassioned suitors. They broke down her door and angered the goddess Diana, who then turned Rodanthe into a flower and her suitors into thorns. The letters in the word ‘rose’ can be rearranged into Eros – the God of Love. Perhaps this is why it has become such a symbol of love. Did you know that different coloured roses have different messages? Red is said to mean love and passion; yellow is for friendship; white for true love and purity of the mind; pink is for friendship or a sweetheart; while black is for farewell. Choosing the right type of roses to begin with would prevent disappointment when planting in local home gardens. There are three main groups of roses being cultivated globally for fragrance, flavourings and landscaping. Be careful when selecting roses from garden centres as many have highland varieties that were grafted from materials obtained from the highlands such as Bogor highland roses (Java) or the Cameron Highlands. These plants have extra special requirements – temperature and light sensitivity – so they are not easy to establish in lowland areas such as Kuching. Even the Borneo Highlands has problems growing varieties from Cameron Highlands, so imagine the problems you’ll have in your home garden. 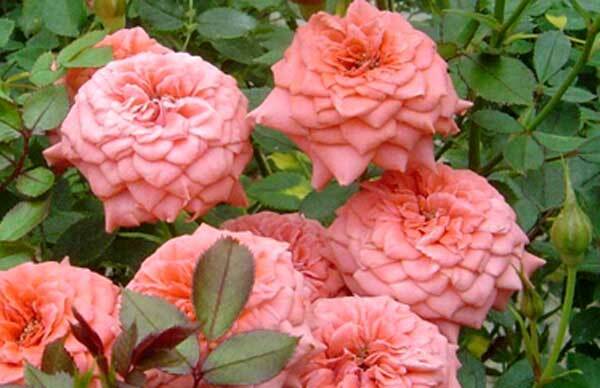 It is best to stick to mini roses and climbing roses as they are the easiest to grow. Hardy varieties will be able to withstand threats from the weather, pests and diseases. Rosa chinesis is a dwarf variety that grows to about 30 centimetres in height. Hybridisation and breeding work have created a whole range of new varieties. The stems are a softwood with many branches and rarely any thorns. Leaves are a medium green with five to seven oval tooth-edged leaflets. Flowers come in a single circle of petals or many. The size of the flowers is about four centimetres across. They can be fragrant or have no scent and now come in many different colours. Red and pink mini roses are sure to bloom when given enough care. Pink-red climbing roses have flowers of three to four inches in diameter. These are good and hardy materials for fences. Thorny rambling and climbing or creeper roses are more difficult to get to flower. 1. Hybrid tea: single flowers on long stalks and full centred flowers. 3. Moss rose: flowers are produced in groups of three to four singles that have a fine soft mossy growth. Over a dozen mini roses are available now and more new ones are on sale every year. There is a special planting medium from Peninsular Malaysia that is a pinkish friable medium soil, similar to our burnt soil. It is good because it is free of diseases and pests, having been subjected to heat treatment. One important addition is organic fertiliser made from cane sugar and tapioca malt after the extraction of sucrose for Ajinomoto. The fertiliser is called ‘Amina’. As far as I know, this is the best input for delicate flowers such as petunia and African daisy. A similar product from Vietnam is now available. Liquid or foliar sprays that come with acid hormone and auxin hormone will also promote growth. I once used a 16-8-22 ‘Floragro’ from Fertiland KL that seemed like a miracle spray that could enlarge small petals. This is a water soluble NPK compound fertiliser with magnesium, sulphur and micro-elements. It is free of sodium and urea and low in chloride with CI at less than 1 per cent. Being 22 per cent potassium oxide, this fertiliser promotes flowering. Flowering does not depend only on the right input of fertiliser but also hormones. Here in Sarawak we get mainly an equal amount of light and darkness. Secondly, we have either a dry and hot season or rainy and warm season. This is a natural condition with plenty of sunlight that is good for vegetative growth but not necessary for promoting flowering. There is also the problem with heavy rainfall at the end and beginning of the year. This is a season when vegetable growers suffered miserably in the past. Thanks to rain-shelter systems or net house systems, plants can be protected from heavy downpours. The use of netting, which was originally introduced to ward off pests, also prevents the splashing of soil and damage to tender young leaves or shoots. Growing roses under shelter to protect them from the rain and sun is ideal to ensure optimum results. We have also seen advances in micro-irrigation for liquid fertilisers and watering, which measures and calibrates the amount of water according to the needs of the plants. For nursery growth, roses are best put in large polybags or pots. Remember that they need more water during active growth periods and less while flowering. You only need to moisten the medium when newly grafted or seeded in beds. For rose growers, the worst headache is red spider mites – tiny reddish creatures. The usual pesticides or miticides are not good enough to control them. Prevention is best by keeping conditions damp and cool because these pests multiply faster in the dry season. Although roses require quite a bit of work, the results are worth it so do not be discouraged! Who knows? Next year you may be able to give your loved ones fresh roses from the garden. Happy Valentine’s Day.